Stressed out? Trouble sleeping? Distracting sounds at work or school? Need a relaxing break from a busy day? If your answered yes to any of those questions then Brainwave Studio is for you! Brainwave Studio is a professionally designed relaxation, stress relief, sleep support, meditation and mind training system, with 40 sessions of carefully selected nature sounds and superb quality ambient music. Brainwave Studio uses isochronic tones, widely regarded as the superior brainwave tone. Isochronic tones pulse at specific frequencies, and stimulate the brain to help you achieve your desired mental state. 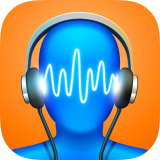 There are several ways how you can use Brainwave Studio for iOS. The standard way of using this app is to simply choose and listen to one of 40 brainwave entrainment programs. For example: start Brainwave Studio, choose “Quick Relax Brake” and tap on the play button. For personalized relaxation experience you can add background sounds to the paying session – tap on the note icon (sounds) and add one of 28 soothing sounds. Each sound has separate volume control which enables you to create a perfect sound atmosphere. If you would like to change the melody that is playing in the selected relaxation session, simply tap the bars icon (music) and select on of 48 available melodies. If you would like to listen only to the background sounds without the melody, start Brainwave Studio and tap on the note icon (sounds), skip the step of selecting the relaxation session. To add isochronic tones to the selected background sounds navigate to the sessions screen and choose one of them, then tap on the bars icon (music) and deactivate the playing melody.